As a longtime reviewer of recipe books, I’ve come to realize there are two distinct categories in this genre. One is the practical cookbook you leave open on your kitchen counter while cooking. It delivers bright, inspiring images that lift you out of the doldrums of your everyday repertoire and offers concise, clear instructions using as little text as possible. Bottom line: it’s super-practical. The second kind is more of a bedside reading book, more literature than cooking aid. It comes with lengthy introductions and reflections on what particular recipes mean to the author and it’s not a book to pull out if you need to bake a quick batch of chocolate chip cookies for the last-minute guests about to arrive or the kids coming home from school. This latter category perfectly fits Daphna Rabinovitch’s cookbook The Baker In Me (Whitecap Books, 2016), which received the top prize in the single subject cookbook category at the Taste Canada Awards earlier this year. 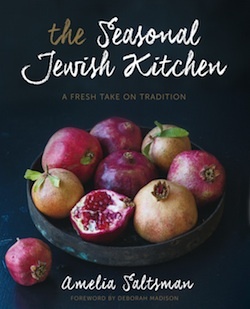 The Jewish author of this 478-page tome has superb credentials that include director of Canadian Living magazine’s test kitchen, studies in Italy and co-authoring a host of other books, which have received accolades from culinary and literary critics. In this, her first solo book, she aims squarely at the ordinary baker and spends many pages explaining the basics for successful results making cookies, bars, chocolate, muffins, breads, cakes, pies and other desserts. You’ll want to read these essays slowly and quietly before you tackle the recipes, which is why I recommend this book as good bedside reading. Thanks to Rabinovitch’s many years in the field, she has a plethora of baking tips and gems to share. She offers pragmatic advice on the art of measuring ingredients, the variety of cooking techniques (convection versus radiant) and what they are best used for, when to use chocolate instead of cocoa powder, and how to make your biscuits flaky. 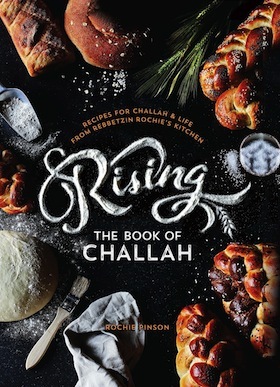 Jewish readers will enjoy her challah, rugelach, Rosh Hashanah honey cakes and Passover recipes. Kid-size bakers will love the oversized peanut butter and oat cookies, the fudgy brownies and the peek-a-boo chocolate cupcakes. And grownup bakers will enjoy the challenge of a chocolate devil’s food cake with chocolate buttercream, One Damn Good Cookie, and the chocolate truffle pecan tart with spun sugar dome. There is lots here to impress friends and family with special occasion and everyday treats. But, as the title suggests, this cookbook is all about baking, so don’t approach it with a dieter’s caution. This is high-calorie fare. We’re talking the full mix of butter, sugar and chocolate with no concessions for waistlines. Rabinovitch’s recipes aren’t that complicated or out of reach for a beginner baker, but there’s a fair amount of reading involved if you want to be sure you’re baking them the right way. For bakers who are keen learners, her expert viewpoint and strategic advice will add volumes to their knowledge of baking. For bakers who just want to get straight to the recipe with no lengthy reading process, this may not be the right choice for a handy kitchen companion. Joyce Goldstein was chef and owner of Square One restaurant in San Francisco; prior to that, she was chef at Chez Panisse café. Today, she is a cooking teacher, restaurant consultant and cookbook author. Her bibliography lists 60 cookbooks, the most recent being The New Mediterranean Jewish Table (University of California Press, 2016). 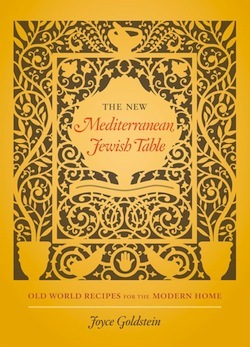 She writes, “This Mediterranean Jewish cookbook for the modern kitchen will build and expand on carefully selected recipes from many of my cookbooks.” The recipes are from the cultures of the Sephardim (those expelled from the Iberian Peninsula), the Maghrebi (those from Morocco, Tunisia, Algeria, Libya and Egypt) and Mizrachi (Jews from Muslim lands since biblical times). After an explanation about kosher laws and the food of Jewish holidays, there are 11 cookbook chapters covering appetizers, spreads and salads (49 recipes), savory pastries (21 recipes), eggs and fritters (24 recipes), soups (29 recipes), rice, pasta and grains (31 recipes), vegetables (48 recipes), fish (46 recipes), poultry (23 recipes), meat (49 recipes), condiments and preserves (24 recipes) and desserts (51 recipes). There are a whopping 395 recipes in all. Each chapter has an explanatory essay, in addition to a list of ingredients and instructions. The volume is so large: recipes go from page to page. Just reading about the origins of each recipe is a wonderful learning experience, but here are two recipes to try. Have ready a large bowl of water to which you have added the lemon juice. Working with one artichoke at a time, trim the stem to two inches if it is tender, then peel away the dark green fibrous outer layer. If the stem is tough, trim it off flush with the bottom. Pull off and discard all of the leaves. Pare away the dark green areas from the base. Cut the artichoke in half lengthwise and carefully remove the choke from each half with a small pointed spoon or a paring knife, then cut each half lengthwise into quarter-inch slices and slip them into the lemon water. Melt the butter in a large saucepan over medium heat. Drain the artichokes, add to the pan and sauté for a few minutes. Add the garlic, potatoes and about 1.5 cups of the broth or enough just to cover the artichokes. Cover the pan and simmer over medium heat until the artichokes are very tender and almost falling apart, 25 to 30 minutes. Remove from the heat and cool slightly. In batches, transfer to a food processor and purée until smooth, then return the purée to the saucepan. Add the remaining 1.5 cups broth and reheat, adding more broth if needed to achieve a consistency you like. You can also add a little cream or milk if you prefer a richer soup. To intensify the artichoke flavor, make the soup a few hours or a day ahead and reheat at serving time. To serve, ladle into soup bowls and garnish with hazelnuts, pine nuts, parsley or mint. Butter 24 muffin pan cups, dust with flour and tap out the excess. In a spice mill or food processor, grind the vanilla bean with the sugar until the bean is ground to a powder. In a small bowl, sift together flour, baking powder, cinnamon, cloves, salt and pepper. In a separate bowl, beat together butter, confectioners sugar and vanilla sugar until creamy and pale. Add eggs and lemon zest and beat until incorporated. Fold in nuts and flour mixture until combined. Spoon batter into muffin cups, two-thirds full. Let rest for one hour. Preheat oven to 400°F. Bake until a toothpick inserted into the centre emerges dry, about 15 minutes. Remove from oven and turn on to racks. Let cool completely. Steven Rothfeld is a travel photographer with an emphasis on culinary cuisine. He has written more than 10 books of photography and lives in Napa Valley, Calif. His cookbook Israel Eats (Gibbs Smith Publishers) came out earlier this year. In the introduction, Rothfeld describes how he met an Israeli on a train in Italy in 1984. The fellow passenger asked Rothfeld why he hadn’t been to Israel. Twenty-five years later, reading Amos Oz’s memoir, Rothfeld’s imagination started working. In 2010, he finally made the trip. “I encountered a world I had never imagined existed in Israel,” he writes, referring in large part to the vibrant cuisine. He had worked on three books previously with chef Nancy Silverton so, when he conceived of Israel Eats, he asked her to join him. Rothfeld and Silverton’s enthusiasm infuses this book. After Haaretz journalist Ronit Vered explains the history of Israel’s cuisine from the 1950s to today, Rothfeld and Silverton embark on a tour of Israel – Tel Aviv-Jaffa, the north, the centre, the south, Jerusalem and the Judean hills, concluding with the “ecosystem of Israel Eats,” meaning the people who contributed to the book. Each “chapter” has an introduction, with accounts of places Rothfeld and Silverton visited and people they met, and is followed by the recipes, each with its own introduction, source and beautiful color photographs. Some of the recipes are from restaurants and chefs, others are from individuals and some are by Silverton. This is not a kosher cookbook but only five recipes are strictly non-kosher and most of those could be adapted by leaving out one ingredient that would not change the tone of the recipe; only one recipe is not adaptable. There are 90 recipes in total, and here are a couple. Heat oil in a heavy eight-inch skillet over medium heat. Arrange tomato slices in the skillet in the shape of a circle. Top the tomato slices with cheese slices. Sprinkle with salt and pepper. Arrange the garlic and chili slices atop the cheese. Bunch the cilantro sprigs in the centre of the skillet. Continue cooking until cheese is soft but not totally melted. Serve immediately. Combine the tomatoes, sugar, water and peppercorns in a medium-size heavy pot and bring to a boil. Reduce heat and simmer, stirring occasionally until the mixture is thick and syrupy and reduced by half, about one hour. Divide the ice cream among bowls. Spoon the tomato jam over the ice cream. Garnish with mint. In writing Zahav: A World of Israeli Cooking (Houghton Mifflin Harcourt, 2015) with Steven Cook, Michael Solomonov hopes to share with other cooks “some of the magic” found in Israel. Israeli-born Solomonov grew up from the age of 2 to 15 in Pittsburgh, then the family returned to Israel. After awhile, when his Bulgarian father and American mother divorced, he returned to the United States, eventually learning to be a chef, graduating from culinary school in 2001. He returned to Israel, where his brother had grown up and was on leave from the army; sadly, his brother was killed soon after, and Solomonov once again left the country. Returning to Pittsburgh, Solomonov met Cook and, in 2005, became chef of their first restaurant, Marigold Kitchen. In 2008, Solomonov and Cook opened the restaurant Zahav in Philadelphia. They also co-own restaurants Percy Street Barbeque, Federal Donuts, Dizengoff and Abe Fisher, all in Philadelphia. In 2011, Solomonov was awarded the James Beard Award for best chef mid-Atlantic. This was the inspiration for Zahav, which opened in May 2008, as well as the cookbook Zahav, whose style is unique. The nine chapters include one on tahini, which has 34 recipes, including seared chicken livers with caramelized onion tahini and tahini shortbread cookies. There are 20 salad recipes, showing that vegetables are everything, including Israeli pickles and spicy fennel salad. 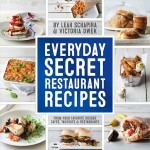 There is a chapter on smaller dishes, with recipes for items like fried cauliflower with herbed labneh. The soup chapter has 16 recipes from around the world, such as celery root soup. The next chapter – “Grandmother’s Borekas, Tradition Was My Teacher” – has 20 recipes, such as fried leek patties. “Live Fire, As Close to Magic as I’ll Come” has 16 recipes, like Bulgarian kebabs and pomegranate-glazed salmon, including mujadara. Then there’s the chapter called “Ben-Gurion’s Rice,” with 11 different recipes. “Mesibah, It’s Party Time” has seven recipes, such as whole fish in grape leaves, and “Milk & Honey is a Glimpse of the Divine” has 17 recipes, including konafi and carrot basboosa. After an introductory essay in each chapter, there are the recipes, and each is also introduced, with casual (and fun-to-read) remarks and easy-to-follow instructions. There are also sidebars with fascinating information about such things as sumac, date molasses, freekah and rose water. 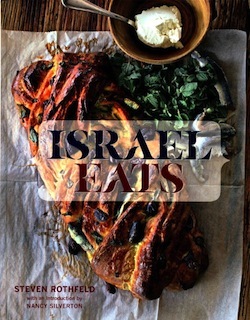 There is no doubt that this book has “a world of Israeli cooking,” and the recipes below reflect that idea. Preheat the oven to 350˚F. Line a baking sheet with parchment paper and set aside. Toss the chickpeas with the oil, transfer to another baking sheet, and roast until crisp, 25 to 30 minutes. Combine the brown sugar, butter and cream in a saucepan over medium heat. Cook, stirring, until the mixture darkens in color slightly and large, lava-like bubbles cover the surface, about 10 minutes. Add the chickpeas and stir to combine. Working quickly and using a rubber spatula, spread the mixture out in an even layer on the prepared baking sheet. Let cool to room temperature. Break into two-inch pieces to serve. The brittle will keep a week in a sealed container. Preheat the oven to 400˚F. Toss the okra with two tablespoons olive oil and arrange on a baking sheet. Bake until the okra turns brown, about 25 minutes. Transfer to a bowl and toss the okra with the remaining three tablespoons of olive oil and the tomato sauce, lemon juice, dried lime and salt. Top with the cilantro. Serve hot or chilled. Preheat the oven to 375˚F, with a rack in the middle. Oil a nine-inch round or square cake pan. Line the bottom with a round of parchment paper, and oil the parchment. Combine the butter, sugar and salt in a mixer or other bowl. Beat on medium high until pale and fluffy, about two minutes. Add melted chocolate and mix just until combined. Scrape down the sides and mix for another few seconds. With the mixer on low speed, add eggs, one at a time, beating until each one is incorporated before adding the next. Scrape down the sides of the bowl, then add almond flour. Mix on low until just incorporated, about 10 seconds. Pour batter into prepared pan and smooth top with spatula. Bake until a toothpick inserted into the centre comes out clean, about 25 minutes. Let cool in pan for 10 minutes before turning out onto a rack to cool completely. In my collection of cookbooks is The Complete International Jewish Cookbook by Evelyn Rose. For more than 30 years, she was food editor of the London Jewish Chronicle. When I received the press release that 100 Best Jewish Recipes (Interlink Books, 2016) by Rose with Judi Rose was being published, I was sure it would be as lovely as the earlier one and was saddened to learn that Evelyn Rose was no longer living – she died in 2003. “My mother passionately believed that each dish must have ta’am – that extra something that makes it taste special and worth the effort for busy people to put on their table,” writes Rose. There are 128 recipes in this new cookbook, enhanced by 38 color photographs. After a foreword, an introduction and an essay on festivals and food, the chapters are listed: small plates (10 recipes), soups (13 recipes), poultry (12 recipes), meat (16 recipes), fish (11 recipes), vegetables and side dishes (23 recipes), bread-bakes and desserts (21 recipes) and basics (22 recipes). A final essay is on adapting recipes for the kosher kitchen. One thing missing from the recipes is whether they are meat, dairy or pareve. Other than that, each recipe has how many servings, how long it will keep in the refrigerator (a clever inclusion not generally listed with recipes), how long it can be frozen and a little introductory note. Styles include Middle Eastern and Sephardi, and the places from where the recipes come include Austria, Lithuania, Syria, Russia, France, Hungary, Germany, Spain, Turkey, Persia, Morocco, China, Italy, Greece, Holland, Britain, Israel, Sicily, Egypt, Indonesia, Armenia and Denmark. As the publisher notes, these are traditional and contemporary recipes, for family meals and special occasions, for both novices and experienced cooks. Here are a few of the traditional, classic recipes. Hard boil eggs for 10 minutes, drain, return to pan, cover with cold water and leave to cool. Fry the onion and garlic gently in the margarine or fat until very soft and a rich brown. As the onion cooks, sprinkle it with sea salt. Peel the eggs and cut in half. Put one aside. Put the onion and garlic with cooking juices into a food processor, process until smooth. Add two eggs, livers, pepper and nutmeg. Process until smooth. Taste and add more seasoning if necessary. Turn mixture into a terrine or oval gratin dish or divide between individual ramekins. Cover with plastic wrap and chill overnight. Refrigerate extra egg. One hour before serving, remove paté from refrigerator to return to room temperature. Pass the remaining egg through a food mill or sieve to decorate the top of the paté. Serves six as an appetizer, eight to 10 as a spread. Keeps five days in the fridge and freezes for one month. Put bird and pieces in a large pot with water, salt and pepper. Cover and bring to a boil. Remove foam with a large metal spoon. Peel and halve onion and carrots, and add to pot with celery, parsley and tomato. Bring to a boil. Reduce heat, cover and continue to simmer three hours until chicken feels very tender when a leg is prodded. Strain soup, reserving giblets and carrots in a separate container. Cover and refrigerate soup. Next day, remove congealed fat and return soup to the pot. Cube giblets and carrots. Add to soup. Serve with matzah balls or noodles. Serves four to six. Keeps three days in the refrigerator and three months in the freezer. Preheat oven to 350˚F and line two baking sheets with parchment paper. Mix flours and baking powder. In a separate bowl, whisk the eggs until thick then gradually whisk in the sugar, followed by the oil, orange zest and vanilla. Stir in enough of the flour to make a rollable, nonsticky dough. Knead until smooth then roll onto a floured board until a half-inch thick. Sprinkle the dough with sugar, roll lightly to press it in. Cut into shapes with cookie cutters and arrange on prepared trays, leaving room for cookies to spread. Bake for 20-25 minutes or until pale gold in color. Leave on wire racks to cool. Makes about 50. Will stay fresh two weeks in an airtight container and freezes for three months. Deborah French’s rollercoaster ride began on June 14, 2004, when she gave birth to her second child, Amariah, who unexpectedly had Down syndrome. “Up until that point, we had absolutely no experience with special needs and never considered we ever would,” said French. Growing up in northwest London, French made aliyah with her husband Johnny and their first two children in 2007. French chose to become a stay-at-home mom with the birth of Amariah. A year later, the couple’s eldest child, Henry, who was 2 years old at the time, was diagnosed with high-functioning autism. “We felt incredibly alone and found those years extremely difficult,” French told the Independent. Going against the advice of many experts who said Henry could not concentrate on a single task for longer than five minutes and that he had poor motor skills, French set about baking cookies with her son one day when he was 4 years old. French was asked if she would consider taking other kids into her kitchen. This paved the way for her cooking classes and, eventually, led to her compiling a comprehensive cooking course for children with special needs. French, who is now the mother of five, has become an expert via life experience. French is an advocate for families and their children with special needs in Israel. As well, she and her husband co-created the Chai on Life organization, which provides opportunities for such families to participate in regular activities while educating the wider community about children with special needs. French’s first foray into writing was a memoir, A Brief Moment in Time (ASD Publishing, 2013), which won honorary mentions at Paris and New York book festivals. 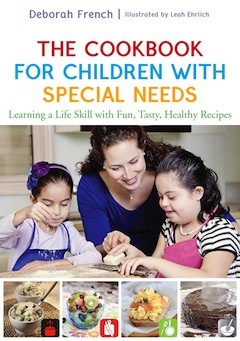 Her most recent publication is The Cookbook for Children with Special Needs (Jessica Kingsley Publishers, 2015). Her cookbook is 200 pages and is geared toward children and young adults with special needs, their parents, caregivers and guardians. In essence, it is a cooking course to be followed from levels 1 through 3, with each level introducing additional foods, techniques and recipes. Within each of the three levels, there are 10 recipes, seven of which are savoury and three of which are sweet. “The focus on savoury dishes reinforces the importance of moderation in our diet, ensuring that our primary foods are healthy ones, but that our indulgent foods are exactly that,” said French. Food writers are privy to a lot of recipes, and many of them, sadly, are repeats of ones already widely familiar, with small variations in ingredients. Infrequently, though, we get access to a compilation of recipes by a skilled author with an innovative eye and a dash of culinary talent, and the result is nothing short of inspiring. That’s Daniella Silver’s The Silver Platter (Artscroll, 2015) in a nutshell. Silver has none of the accolades of a celebrity chef – she doesn’t call herself a professional and she never spent a day in culinary school. Still, what she lacks in education she more than makes up for in passion and ingenuity in her work. Her recipes take common, easily obtained ingredients and put them together in spectacular new ways that highlight their flavor and versatility. Lay your hands on The Silver Platter and you feel an urge to get into the kitchen and start cooking. A mother of kids with allergies, Silver is sensitive about gluten and notes whether each of her recipes is pareve, gluten-free, freezable and if substitutions could make it appropriate for Passover. She collaborated with Norene Gilletz to write this book and adds “Norene’s Notes” at the end of each recipe. That’s great because Gilletz is a no-mess, no-fuss chef who offers great tips on food storage, easy cleanup tricks, uses for leftovers and substitution possibilities. Each recipe has a color image of the prepared dish on the facing page and all look incredibly tempting. I have a weakness for salads and vegetarian dishes, so I loved the panko-topped bok choy with edamame, the shaved corn and asparagus salad, and the kale salad with roasted sweet potatoes. Eye candy abounds and, in almost every recipe, the ingredient list adds new flavors to old staples. For example, lentil cranberry salad; mango chicken with leeks; parsnip latkes; and roasted squash with red onion and pears. The Silver Platter is eye candy in the best sense of the word. This is a recipe book that will earn its chefs heaps of praise as they create easy dishes with ingredients that are mostly kitchen staples. That means no hunting the grocery stores for that odd ingredient you’ve never heard of before. Nutritional information for each dish is listed in the appendix and more than half of the 160 recipes, which cover fish, meat, poultry, desserts, appetizers and soups and salads, are gluten-free and Passover-friendly. This book is a keeper on the recipe shelf. Kudos to Silver on her winning combinations in a recipe book that will inspire even long-dormant chefs to get cooking. Here is but one example, straight from The Silver Platter. Coat a large roasting pan with nonstick cooking spray. Add brisket; sprinkle with salt, pepper, onion powder and garlic powder. Rub brisket with spices to coat on all sides. In a large nonstick skillet, heat oil over medium heat. Sauté onions for five minutes, until softened. Stir in parsley, tomato paste, honey, bay leaves, vinegar and wine. Simmer for five minutes, stirring occasionally. Let cool. Pour sauce over, around and under the brisket. Cover and marinate in the refrigerator for at least one hour or overnight, turning occasionally. Preheat oven to 325°F. Bake, covered, for three to three-and-a-half hours or until meat is fork-tender. Calculate 45 minutes per pound to determine the cooking time. Discard bay leaves. Let cool. Refrigerate several hours or overnight. Discard hardened fat from gravy. Trim excess fat from brisket. Slice against the grain to desired thickness. Reheat, covered, in pan gravy at 350°F for 25-30 minutes. 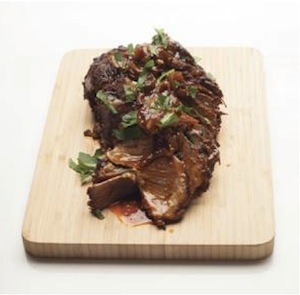 Slow cooker method: season brisket and prepare sauce as above; add to slow cooker insert coated with nonstick cooking spray. Marinate overnight in the refrigerator. Place insert into slow cooker; cook on low for eight to 10 hours. Ask your butcher to cut a very large brisket (8 lb/3.6 kg) in half. Total cooking time will be the same as for one 4 lb/1.8 kg brisket. Brisket should be cooked “low and slow,” with lots of onions. The internal temperature should not rise above 180°F on a meat thermometer; after it reaches 200°F, the brisket will become dry.